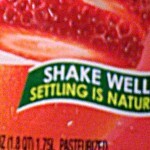 As I was throwing away an empty juice bottle, I noticed the words, “Shake Well: Settling is Natural.” I’d noticed it when I first opened the bottle, but it hit me differently that time. It sounded like an analogy to me. Settling is natural. That’s quite the statement, right? We tend to settle when we believe things can’t get better. For example, we may settle for a job that isn’t ideal. At times, settling is not a bad thing, such as settling for a car with a lower payment that fits your current budget, or settling on a dinner menu that someone else may want. When it comes to your marriage, however, it can be easy to settle into a boring routine and sometimes we need to shake things up. Your marriage doesn’t have to be dull and distant. Shake it up! Fireproof your marriage. If things are not headed in the right direction, give the Love Dare a try. Break up the routine and do something different. Check out Edward Lee’s new book, Elevate Your Marriage: 7 Practices of Highly Intimate Couples! What tips do you have to shake things up in your marriage? Keri Kitchen is a devoted wife and mother, blogger, author of Love Isn’t Selfish, licensed mental health counselor, and founder of The Carys Rainn Foundation. To read more, visit her blog at www.aftertherainn.com.